A. H. Andrews & Co. manufactured chairs for the opera, theater, courthouse, and church. 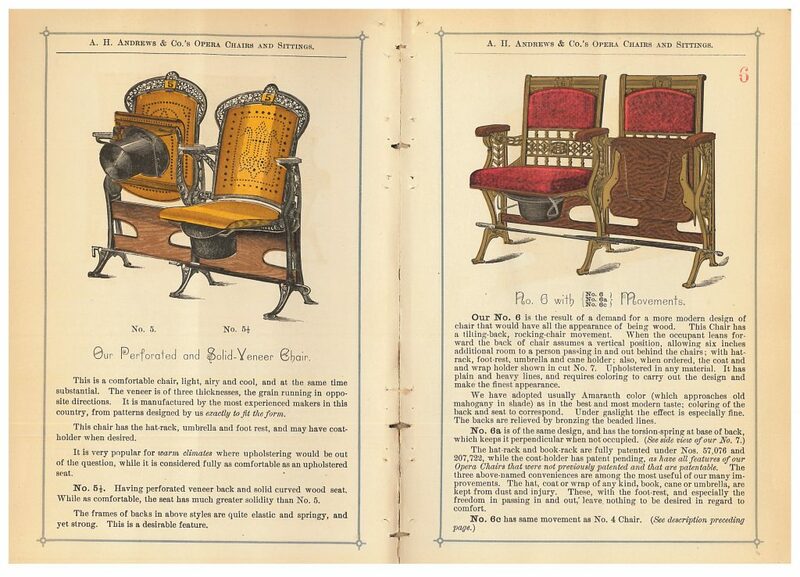 This 1886 catalog titled Catalogue of Improved Opera Chairs shows a variety of these styles. Some chairs were upholstered while others had wood seats or perforated veneer backs. But the chairs also had several very convenient and comfortable special features. A. H. Andrews & Co., Chicago, IL. 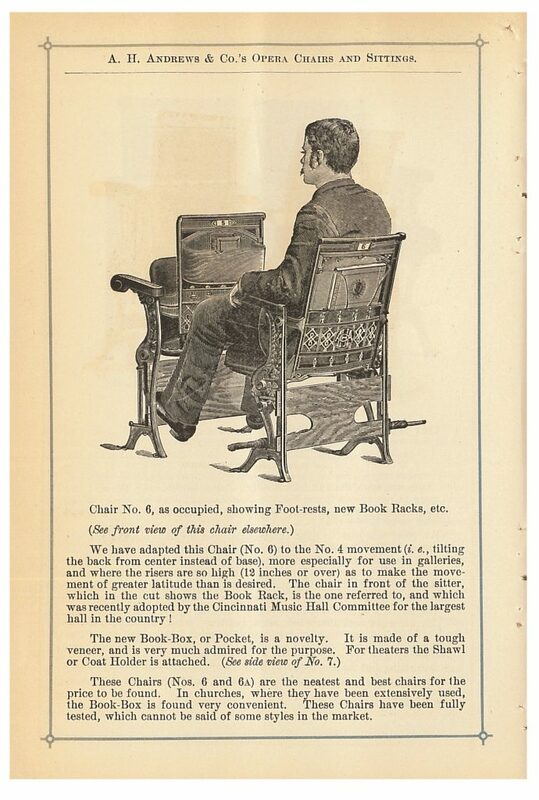 Catalogue of Improved Opera Chairs, 1886, front cover of catalog, opera chair. A. H. Andrews & Co., Chicago, IL. 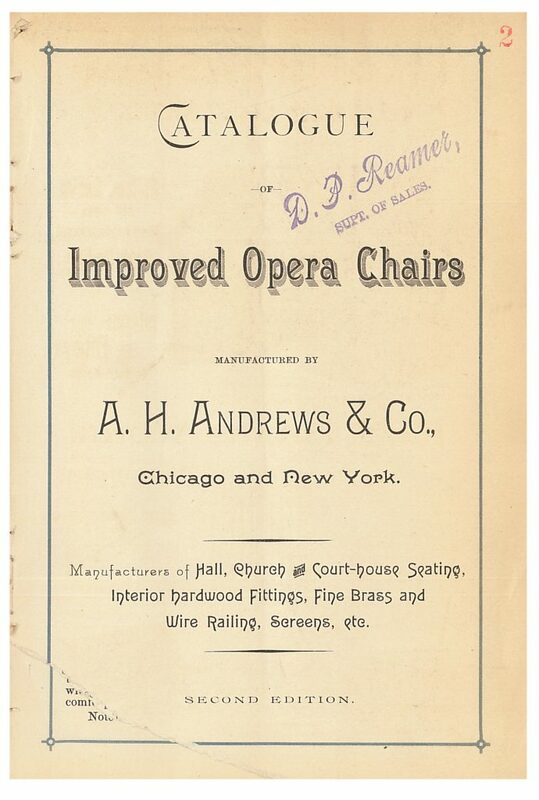 Catalogue of Improved Opera Chairs, 1886, title page. One feature was the hat rack. Where did men in 1886 attending the opera store their top hats during the performance? Under the seat. The hat was held in place by the brim of the hat, as shown in the images below. The chair also had a cane or umbrella rack allowing the cane or umbrella to stay safely out of the way and lie horizontal on the rack beneath the seat. A. H. Andrews & Co., Chicago, IL. Catalogue of Improved Opera Chairs, 1886, opera chairs equipped with hat rack and cane or umbrella rack. These chairs also had the option of the book rack or book box which was attached to the back of the chair in front of you. Another added comfort, illustrated by the man sitting in the chair below, was the foot rest. A. H. Andrews & Co., Chicago, IL. Catalogue of Improved Opera Chairs, 1886, man sitting in opera chair equipped with foot rests, book rack, and cane or umbrella rack. And what about your coat? Where did you put that so it stayed clean and did not fall on the floor or get in the way? A coat rack was attached to the back of the chair in front of you, as illustrated below. The coat rack also held a shawl, wrap, or other outer garment. A. H. Andrews & Co., Chicago, IL. 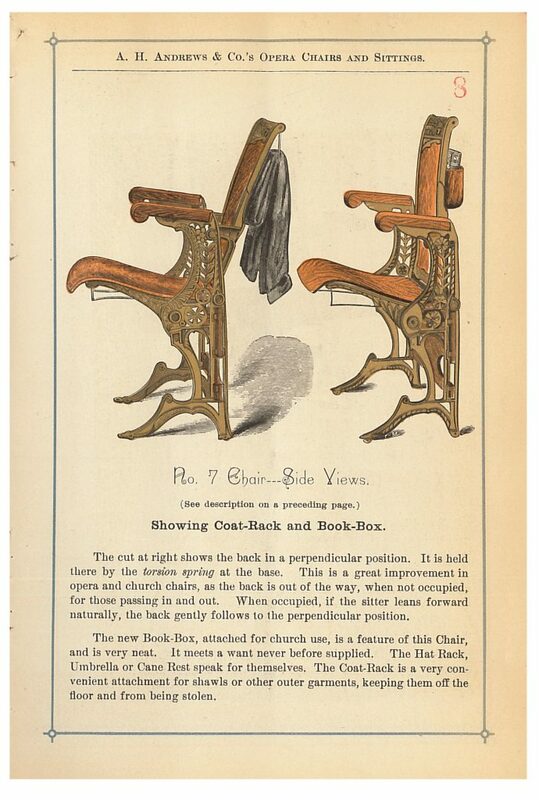 Catalogue of Improved Opera Chairs, 1886, side views of opera chairs equipped with coat rack and book rack. 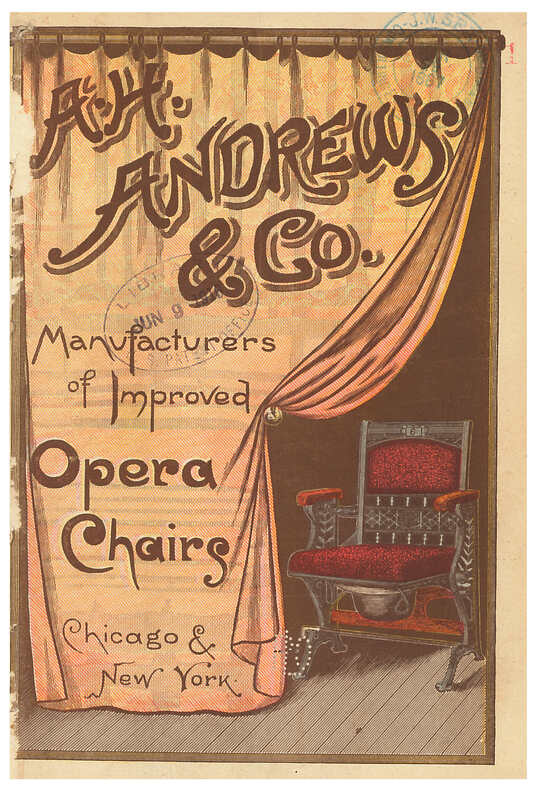 Catalogue of Improved Opera Chairs by A. H. Andrews & Co. is located in the Trade Literature Collection at the National Museum of American History Library. The 1914 City Hall in my hometown still has racks under the seats for hats. We are in Montana and they still get used now and then. City Hall has built-in spittoons, too.